Direct Mail Campaign - Flottman Company. Get at least 25% of University of Cincinnati Lindner College of Business alumni to complete Bloomberg Businessweek‘s survey in order to qualify the school for Bloomberg’s MBA College Ranking List. A direct mail campaign that tied in with emails and events to inform alumni about the survey and encourage participation. 26.5 percent of full-time alumni and 31.2 percent of part-time alumni completed the survey, surpassing the national average. 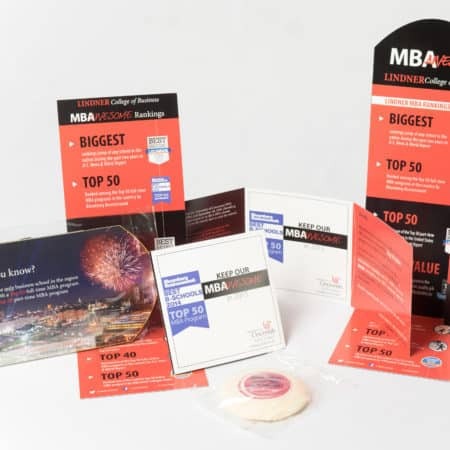 This direct mail campaign for the University of Cincinnati consisted of four separate mailers over a five month period. The campaign also included email marketing and events. The goal of the campaign was to convince alumni to complete a survey in order to qualify the school for ranking on Bloomberg Businessweek‘s MBA College Ranking list. We partnered with UC’s design team, and all four mailers were produced in-house at Flottman Company. Three of the mailers utilized our commercial folding expertise. We personalized every aspect of the campaign to grab recipients’ attention and foster a sense of responsibility to help their school. 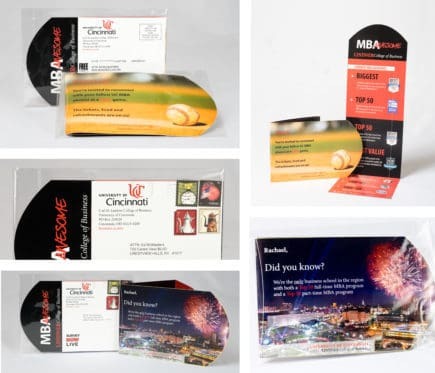 The first and second direct mail pieces were die-cut and folded mailers. The first two mailers were both die-cut tri-folded pieces. The first served as an invitation for recipients to attend a Cincinnati Reds baseball game with their fellow alumni, an event that served as a way to introduce the survey to alumni. The second mailer was sent after the game, and focused on the merits and accomplishments of the school. The piece encouraged recipients to complete the survey as a way to help the school continue to grow and succeed. The mailers were sent in clear envelopes to give recipients a glimpse of what was inside. The simple rounded-edge die-cut combined with the clear envelopes created a unique piece that stood out in mailboxes. By creating folded pieces, we had space to include all relevant information about the event, the school and the survey. 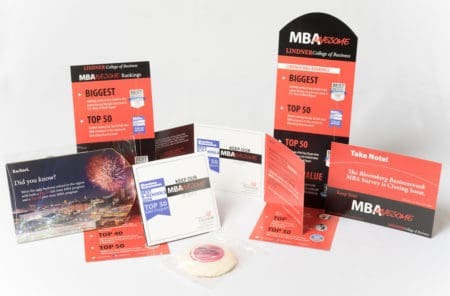 The third mailer included a folded informational card along with a branded Busken cookie. The third folded mailer also focused on the school’s success. It included an infographic of the school’s past achievements and highlighted the urgency to complete the survey. The mailer also included a branded cookie from a local bakery as an added incentive to participate. The fourth mailer consisted of a flat card sent with a personalized notepad. It featured similar design work and information as the other pieces, and served as a final reminder to encourage alumni to take the survey. UC was one of the first universities in the country to surpass the necessary 25 percent completion rate, and finished with one of the top response percentages. 26.5 percent of full-time alumni and 31.2 percent of part-time alumni completed the survey, surpassing the national average. The number of completed surveys rose after the delivery of each direct mail piece. Most importantly, the University of Cincinnati qualified for the Bloomberg Businessweek‘s Top Business School Rankings! The project also helped increase brand awareness for the college, and the school has seen more and higher-quality applicants since the completion of the campaign. 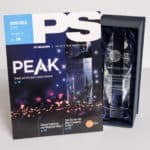 The campaign was a Grand Award Winner in Print Solutions magazine’s annual PEAK Awards for Best Cross-Media Marketing Campaign for a Client. The magazine included a write-up on the campaign in the edition announcing the award winners. The PEAK Awards program recognizes excellence in marketing services and print by promoting projects that display innovation and quality and deliver a high return on investment. How can direct mail help your company succeed? Request a quote today!